Interoperability and sharing of data have been top concerns in the telemedicine debate. BMD has been involved in OHDSI to contribute to the creation of solutions in this area. OHDSI’s aim is to promote collaboration between different disciplines and stakeholders to create value with health data using analytics. By doing so, decision-making in healthcare can be improved and better care can be provided. By using an open-source approach for the solutions, a global network connects researchers and databases, and facilitates research and cooperation. 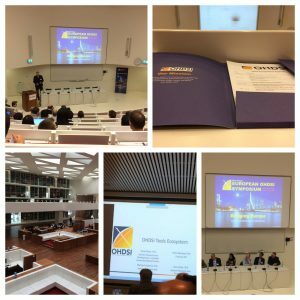 OHDSI Europe was set up to build upon the global network and improve the existing networks within Europe. The heart of the centre is located in the Erasmus University Medical Centre, in Rotterdam. The first European symposium was organised on March 23-24th this year, and fully dedicated to ‘Bridging Europe’. One of the steps OHDSI is taking towards improving interoperability and collaboration is creating the OMOP Common Data Model (CDM). Currently, electronic medical records and administrative claims both store patient data. However, each with a different purpose. The data stored in the EMR are mainly aimed at supporting clinical practice for patient care, whereas the data stored in administrative claims are used for insurance purposes. As a result, data are stored in different organisations, using different formats and terminologies. The absence of a single system using one common methodology, has led to the idea of developing the OMOP CDM, which accommodates both administrative claims and EMR. The creation of this database also facilitates collaborative research across different data sources globally, and will make it easier to access all collected data in one location. The model provides a systematic analysis of different observational databases to convert data within those databases into a common format and a common representation of terminologies, vocabularies and coding schemes. The disparate databases can then be systematically analysed through a library of standard analytic routines. For more in-depth information and technical insights, view the papers written by BMD team members** linked below. If you have any other questions, or want to know how we can help you improve your data integration, visit our consulting page or contact us using the form at the bottom of the page. Bastião Silva, L., Días, C., van der Lei, J., and Oliveira, J. L. (2014). Architecture to summarize patient-level data across borders and countries. Studies in health technology and informatics, 216:687–690.